Wandering in the garden at night is one of the gifts of summer. The hollows in our concrete wall (made from blocks found underground) are perfect for holding candles, and the effect is very beautiful, a simple glass ramekin from a dessert creating a lovely reflection in the light. We just like to stand quietly, watch and listen: maybe hearing frogs rustling in the grass, birds shifting about in the trees where they roost, and sometimes a special treat of an owl call. The fragrances change at night too. We collected white campion seeds from a roadside especially to bring it into our garden for night-time fragrance – it’s somewhere between hyacinth and jasmine. There is a peace and stillness in the garden at night that captures what matters to us. Trying to live a simple life is for us about taking a wider and less self-focussed view, caring about humanity and the world we live in, which is beyond politics but is essentially the most political thing we can do, by living it through positive actions on a daily basis. So, here we are on the winter solstice, marking the shortest day of the year and coincidentally the last day of our money month number 9. 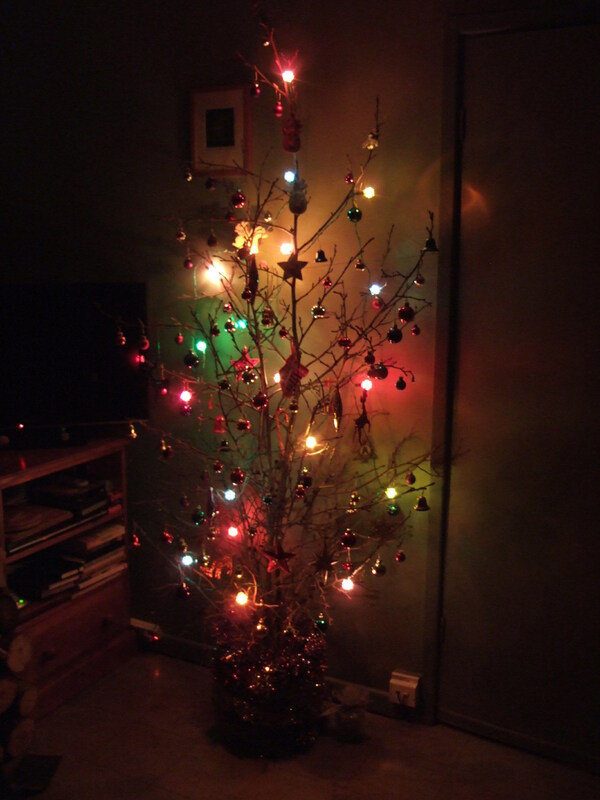 The good news is that despite the time of year, we really do have some money left over! Not much – just about 8% of our income – but that’s better than nothing. In fact, only about half our extra spending this month was for Christmas, the other half was on unexpected car repairs. The Christmas spend includes gifts, materials with which to make some gifts, our contribution of drinks for the Christmas dinner this year, and postage of cards. Our food spend averaged £15 per day, higher than usual but it did include more meals out and takeaways than usual. There were two birthdays this month as well as Christmas coming up. Transport: As well as the big car costs, there were more bus trips than usual due to rain, and Lucy then purchased a season ticket to make this more cost effective. Also 3 fills of petrol. Gifts: All done – of course we can’t say what they were! 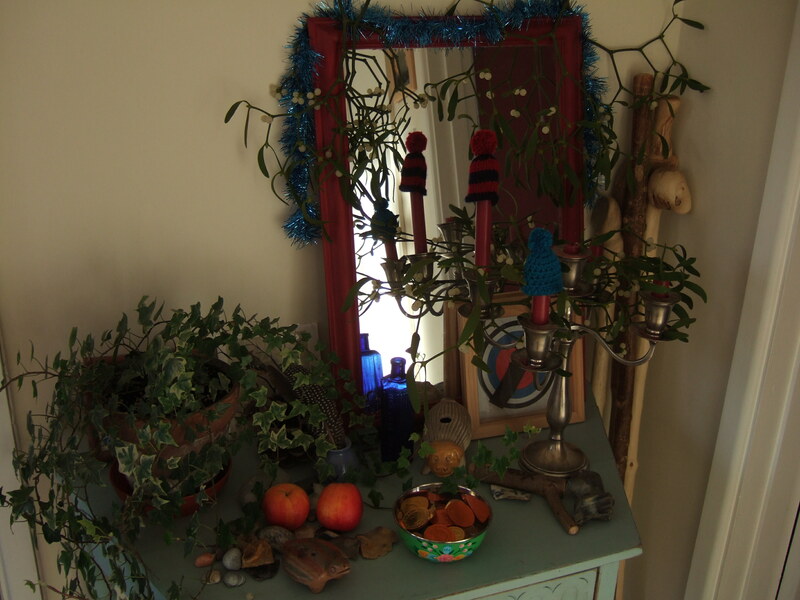 Our home is now decorated for the festive season, including a wonderful gift of some mistletoe. We’ll be trying to get the berries to propagate onto one of the trees in the garden – you can find advice abut doing that here. Although a lot of bloggers are now looking back on 2014, we are not reviewing the year in this way as our financial & blogging year started in March. This is purely coincidental, but it does fit beautifully with the natural year and seasons. So for us winter is the last quarter of our calendar, and in the coming months we’ll be continuing to channel our resources and time towards what matters most to us: living simply, safely, more lightly on the planet, and happily.